Use my time more efficiently. I've learned that a rigid schedule/to-do list doesn't work for me. If I don't want to do the thing I'm supposed to be doing at the time and I can get away with not doing it, I'll end up doing nothing. I'll lose an hour on youtube or I'll watch a TV show I'm not that interested in when I could actually be using that time to do something else from my list. 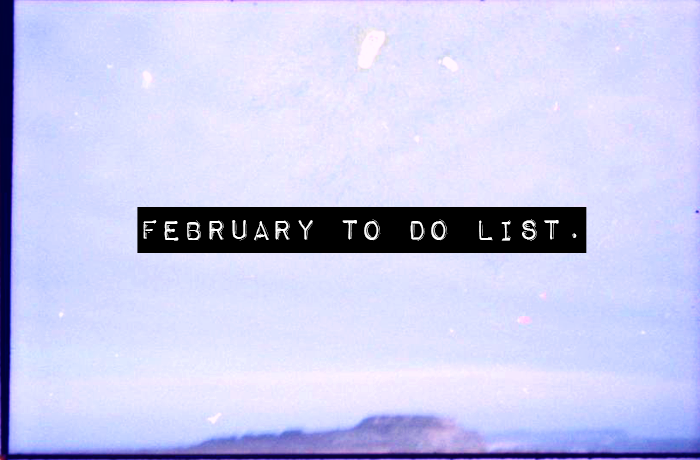 February is the month of getting things done! I'd like to be a little more present, to take time to focus on the here & now rather than the future or over-thinking the past. I'd also like to be more mindful of the things I purchase, only allowing new things that I really need. February is all about keeping things simple, I think. Oh and hopefully finishing this bloomin' awful essay over the weekend! Is there anything you'd like to achieve this month? I love this, I'm so the same. I am always wanting to use my time more efficiently as I hate wasting it but too rigid doesn't seem to work for me either. I think it makes me want to rebel against it and I'll spend an entire day on Pinterest instead... oops! I'm trying to define the things I most want to get done each day and then just do the next thing, so I have a choice about what I'm doing but I'm still being productive to an extent. Good luck with the essay! Kind of tying in with yours, I want to spend more time reading and less time on my laptop. I'm not really adhering to that right now, but I'll get there. mindfulness is something that has been (no pun intended) on my mind a lot lately - i'm currently reading ariana huffington's "thrive" which touches on this subject too! it's definitely something that i'm working on too... it sounds so simple but it's not easy! I'm with you on using time more efficiently and so far so good. I'm trying to not do everything at once so I do nothing for days and focus on what needs to be done vs what can wait and less time of course sitting on the sofa watching tv! These are really good goals, Jennie! I'm also hoping/planning/working towards a really productive month - both with my blog but also with this damned thesis of mine. I'm feeling motivated about it for the first time in a while though! I especially like that you mentioned wanting to be more mindful. It's something I'm always working towards, but I think I need to put it up at the front of my resolution list for February. Hope you're having a happy week so far! What a lovely post idea! Good luck with your to do list! I feel inspired to write my own. I hope you don't mind? I need to use my time more efficiently... there is so much I want to get done but sometimes I get sidetracked with tv or youtube :/ sigh... hopefully I'll get better! I definitely need to use my time more efficiently but it's definitely something I struggle with - some nights it will be time for bed and I'll honestly think to myself 'WHAT have I actually done tonight?!' The answer is usually 'make dinner, tidy up a bit, wander around the flat, read part of an article, watched a couple of YouTube videos...' You get the idea! The most frustrating part is I'm always happier when I make the effort to stick to a project and stick off at least one goal (even if that goal is to read the end of my book) every evening. It's something I have to try hard at every day - but at least we're trying! Reading your latest "Read in January" post on your book blog has really inspired me to read more! I really want to spend less time in the digital world and switch off once a week this month! I want to do exactly this, use my time better and not just waste it when there are other things I should be doing. I hope you achieve this in February. i'm totally the same in terms of having a rigid schedule, but i do love writing to do lists mostly so i know i can let something leave my mind and it won't be forgotten completely because i've written it down. it also helps me to look at the list and tackle one big thing at a time or get the small ones out of the way first depending on my mood. but it's a really big motivating factor to see things getting crossed off that list and it encourages me to do one more thing before i stop for the night. Jennie May, I've known you quite a few years now, and you are still one of my favourites (sorry for the cliche tone), but I've always thought of you you as such a well grounded, reserved and inspiring person... I know we are of the same age, so you could say it is obvious we will have a lot in common, but your writing ALWAYS shouts out to me. I wrote some thoughts on simplicity and how I really need to focus on the important factors of my life instead of taking on too much and failing or feeling bad about the irrelevant. Life really is what you make it - that's been my toughest lesson in life. These are both things I'm working on at the moment as well - it's so easy to lose an hour to nothing! I hope February is a wonderful month for yout Jennie!! Haha, I need to learn how to use my time more efficiently as well. I've written to-do lists on my planner and while it helps a little, laziness naturally kicks in! I just hope that I have the "can-do" attitude from the beginning to the end. I find I'm good at procrastinating in the evenings when I'm tired but good at getting things done in the mornings so I'm going to try to rearrange my schedule a little bit to make the most of that fact!